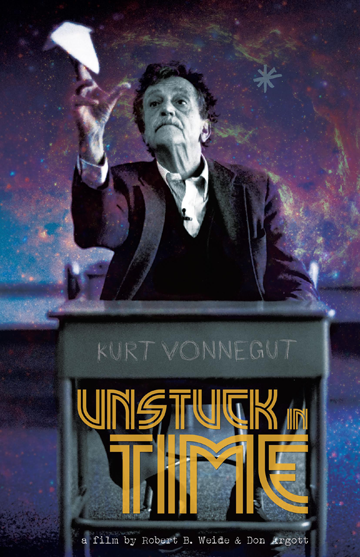 Thank you to everyone who pledged to the successful Kickstarter campaign for our documentary, Kurt Vonnegut: Unstuck in Time. We are still receiving inquiries from people who wish to donate to the film, which we are happy to accommodate, via the PayPal link on this page (credit cards also accepted). If you wish to receive a pledge reward, please visit our original Kickstarter page, then email us at info@vonnegutdoc.com. We will tell you if the reward is still available, and what to add for shipping/handling to your location. If you just want to make a straight donation, you can do so at any time via our PayPal/credit card link. Thank you! PRESS: Please click on the password-protected PRESS link above for a downloadable press release and hi-res production photos. Almost eight years after his death, KURT VONNEGUT remains one of the most popular literary figures of the 20th and 21st Centuries. Readers from one generation to the next, the world over, continue to find their lives transformed by his comic and cosmic insights, on display in such bestselling books as Cat’s Cradle, Slaughterhouse-Five, Breakfast of Champions, Mother Night, God Bless You Mr. Rosewater, and on and on. Amazingly, all of Vonnegut’s works remain in print, and his popularity shows no sign of waning. Yet to-date, there has been no definitive film documentary covering his extraordinary life and work. ROBERT WEIDE has been trying to correct that oversight for 33 years. In 2015, with your help, it will finally happen. In 1982, a young filmmaker wrote a letter to his literary idol, proposing a documentary on the author’s life and work. Kurt Vonnegut soon met with Robert Weide and authorized the production. Weide thought it would take a few months to raise the needed financing, and figured a film could be completed within the year. That was 33 years ago. As the years rolled by, something unexpected happened — filmmaker and subject would become close friends. The upside to this was that Vonnegut would open up to Weide about his life and work in a personal way never before captured on camera. The downside was Weide’s concern that he might be jeopardizing the “journalistic integrity” of the film. Despite his uncertainty, Weide kept filming Vonnegut (and principal people in his life) until shortly before the author’s death in 2007. After Vonnegut’s passing, Weide would still log time in the editing room, but with his friend now gone, and no concrete financing in place, the film lingered. Finally, it was Vonnegut scholar Jerome Klinkowitz (one of the interview subjects) who suggested full disclosure, citing that the evolving friendship between author and fan should be folded into the film — in the same way that Vonnegut often interacts with characters in his own fictional narratives. Filmmaker DON ARGOTT was recruited to document the new “meta” angle, while Weide carried on with Vonnegut’s life story, as originally planned. Since Weide had already taken the film as far as he could on his own dime, it was now just a matter of financing. If the current Kickstarter campaign is successful, Weide and Argott will move forward with production, aiming for completion in late 2015. Weide says it’s “none too son,” pointing out that he was only 22 when he first obtained Vonnegut’s consent. The “old man,” as Weide affectionately called him, was 60. This year, Weide will be only four years short of the “old man’s” age when they first shook hands on the deal. Please see the links atop this page for productions photos and a list of contributors and funders, and outside links. © 2000-2014 Whyaduck Productions, Inc.